I mentioned in my last post with Cupid that I got my package with my new purchase(S). As in plural! 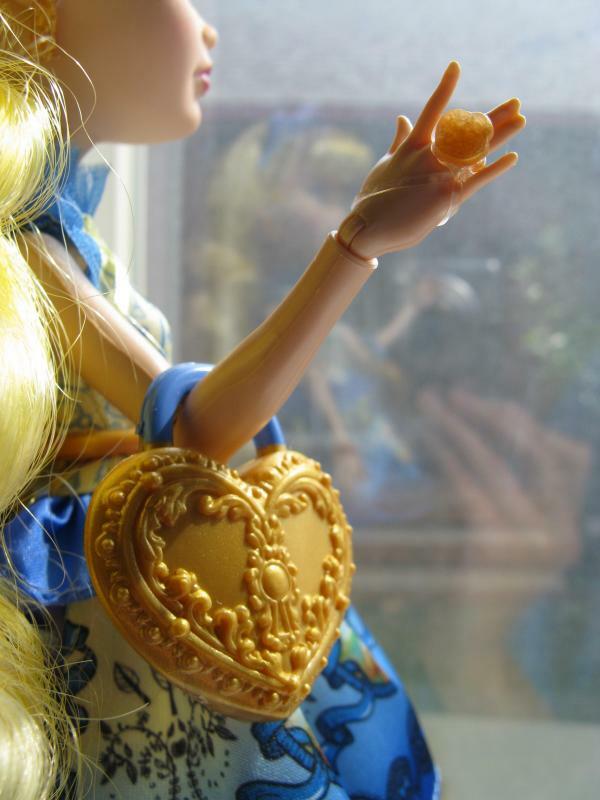 There are more Ever After High Dolls to post about! What can I say, I'm obsessed! 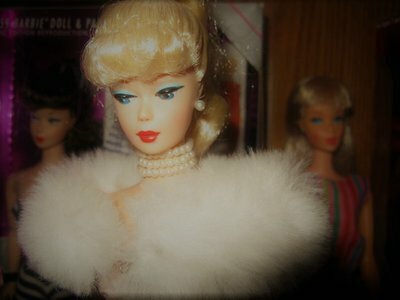 Blondie wasn't a doll that struck me as being one of my "have to haves." 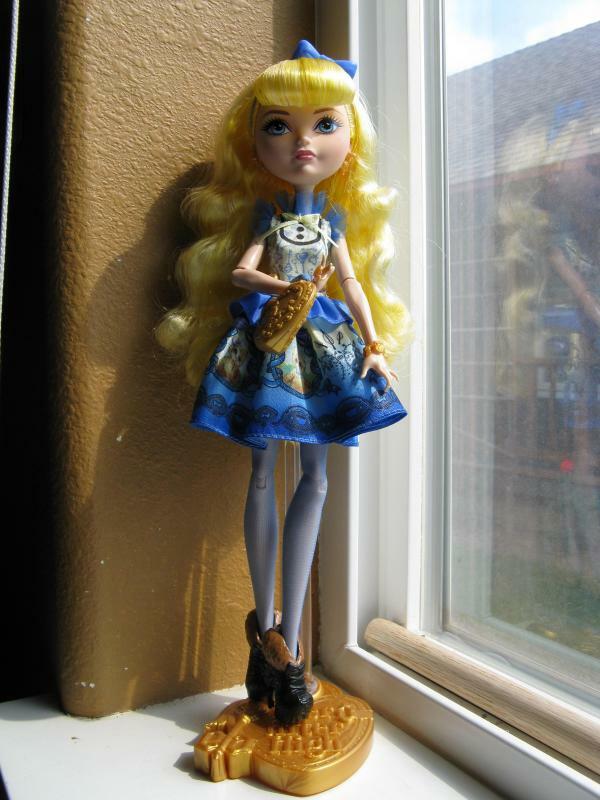 But I wanted all the first wave of Ever After High and after getting her, she kind of grew on me. 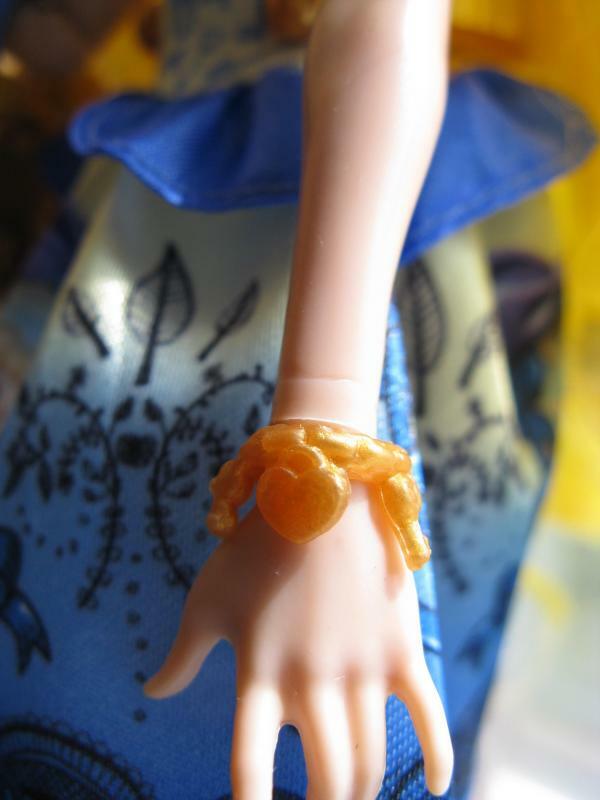 On the other hand, her Thronecoming doll is WOW! She has a cute little dress that is reminiscent of Goldielocks. And it has pictures of the three bears on it! I take that back. If you look around the entire skirt it has pictures of 5 bears on it. Her top has pictures of keys on it. Blondie has a cute charm bracelet with pictures of hearts, a key, and bears on it. She has a heart purse with a keyhole on it and a ring that bears the same heart pattern. Her dangly earrings are a key and a bear. It's hard to see in these pictures. Blondie has short boots with fir at the top and the heel is a key. Really cool! Blondie has cute bangs with a bow at the top of her hair. She has wavy hair but unfortunately the box left a bald spot that I've been trying to cover up (don't you hate that!) What's neat though is that you can see that there are streaks of darker golden hair mixed in with her blonde. Overall, I'm pleased with Blondie's hair. Blondie falls into the ranks of the Ever After Royals. 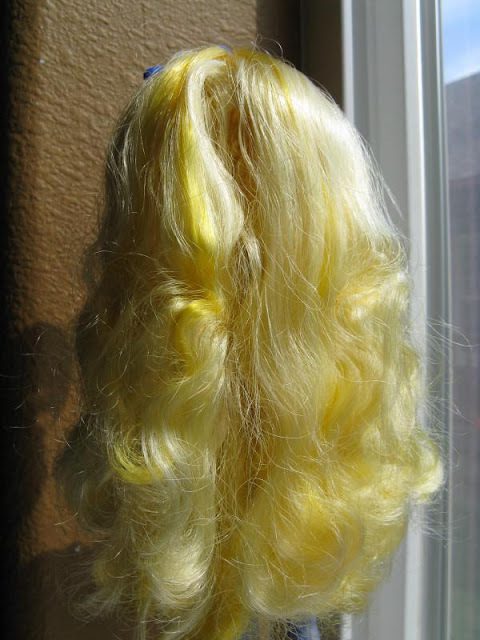 However Goldilocks was not a princess. It's actually kind of funny in the webisodes she tries to prove that she comes from a history of ancient kings and queens and she'll tell anyone who wants to listen. :) She can also open any locked door which proves helpful for the other girls who may have locked themselves out of their dorm room. I think that's a cute feature. 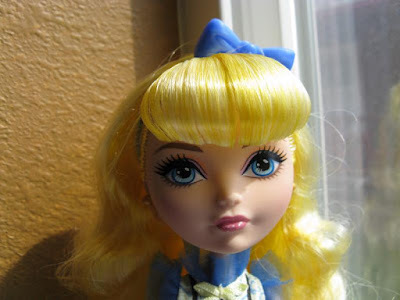 Honestly Blondie is not a real exciting character, I like her doll and I think she's a good addition but I don't LOVE her. What do you think of Blondie Lockes? Let me know in the comments! Blondie is very cute, she reminds me of Alice in Wonderland. That's a good resemblance! I never thought of Alice. 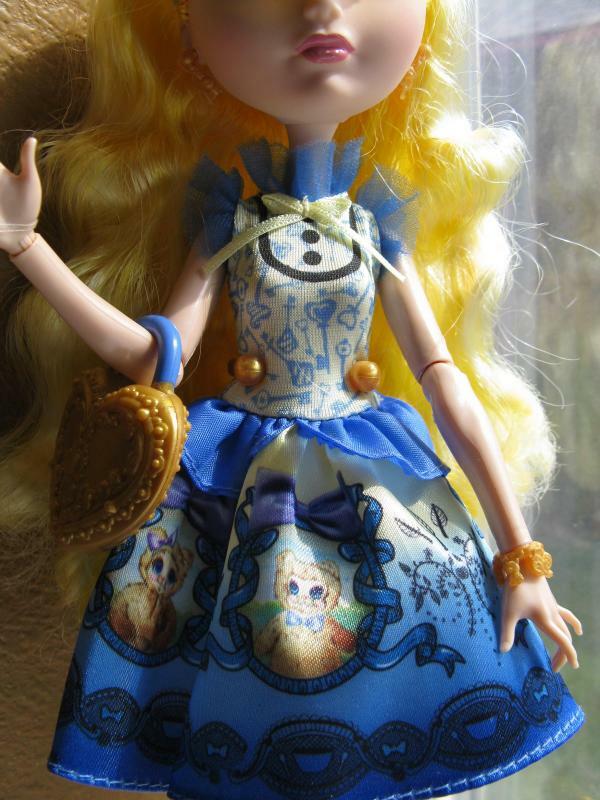 I wonder if they will do an Alice themed doll. I mean they have Maddie and Lizzie right? I think I heard somewhere that Alice in Wonderland has a son but I could be wrong. We shall see! The Group! and a Project! and some Monster High!